Looking southeast towards the reconstructed mound and northern drystone wall entrance to Barclodiad y Gawres. Don't be fooled by the apparent earthen mound covering this monument - it is a turf covered concrete dome that was constructed after the site was excavated in 1953 although its original name still remains, 'Barclodiad y Gawres' means the 'Giantess's apronful'. The dome replaced what was presumably a cobble stone cairn that had been heavily robbed as an easy source of building material in the 18th century. It is what is inside however, that is of interest, unfortunately it is kept behind locked gates in perpetual semi darkness and unless you have access to the key* and a powerful torch the remains of this passage grave must be glimpsed through iron bars. 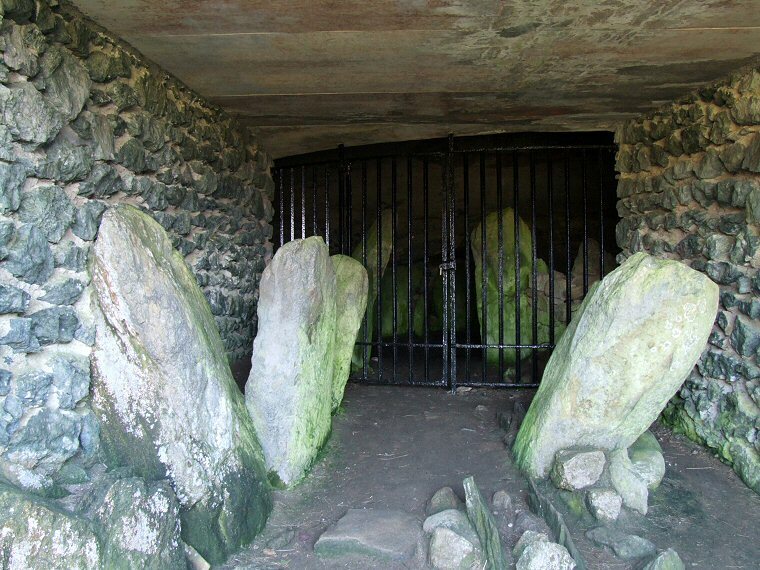 The grave itself consists of a northern 6 metre passage that leads to a central area with a terminal chamber and a pair of side chambers to the east and west. 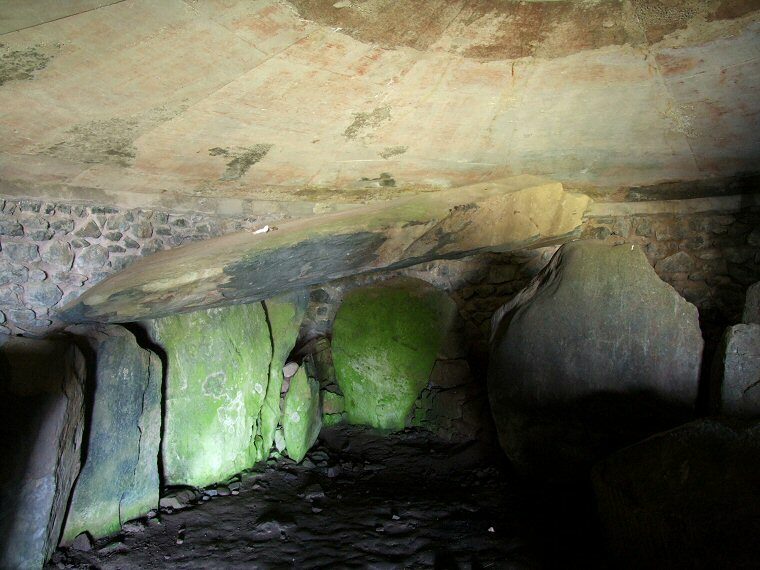 This type of burial chamber is related to some of those in Ireland and further links with that country are provided by the carved stones that make up the tomb - three of the stones in the passage and two in the chambers are decorated with spirals, chevrons and lozenges. In the pictures below the stone numbers are taken from Lynch and Nash (1967 & 2006). 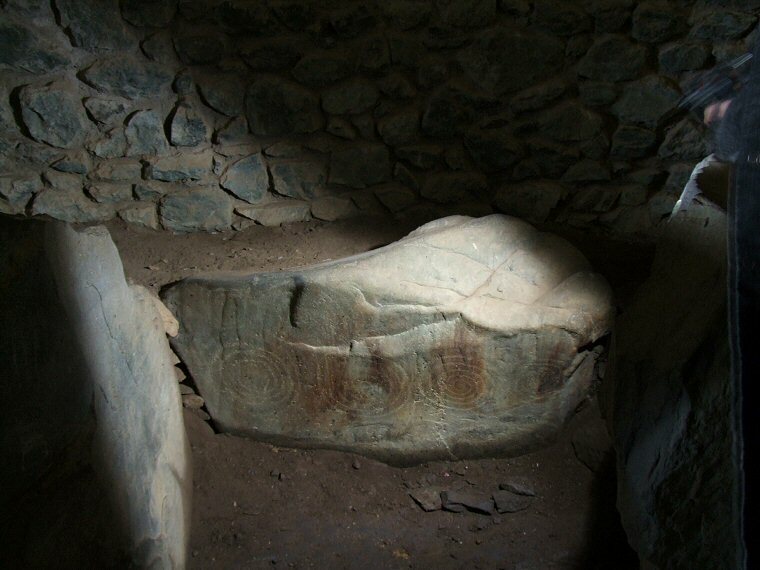 See also the passage grave of Bryn Celli Ddu 11 miles away to the east for an example of a similar carved stone. When Barclodiad y Gawres was excavated the cremated remains of two youths were found in the western chamber as well as animal bones and a hearth containing many reptile and small mammal bones as well as fish and shellfish remnants. *Update 2009 - For many years it was possible to borrow a key to the inner chamber from the Wayside Store in Llanfaelog but due to vandalism this is no longer possible. Visitors should contact the store to arrange an appointment to be accompanied to the site by a member of staff who allow them access. This is restricted to Saturdays, Sundays and Bank Holiday Mondays between 12-4pm from the beginning of April to the end of October. Update - A further decorated stone was discovered in the tomb in 2001 and is documented on the Megalithics website. 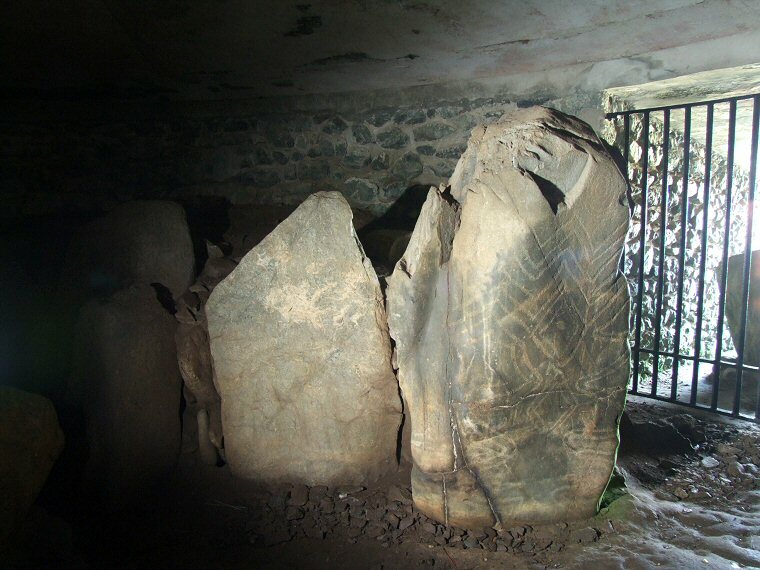 Barclodiad y Gawres - Stones of the entrance passage with the chambers behind the locked gate. Barclodiad y Gawres - Capstone of the southern chamber. Barclodiad y Gawres - Stone C16 to the west of the entrance is decorated with diamond carvings, chevrons and serpentine grooves as well as a small anticlockwise spiral on the upper right of the stone. 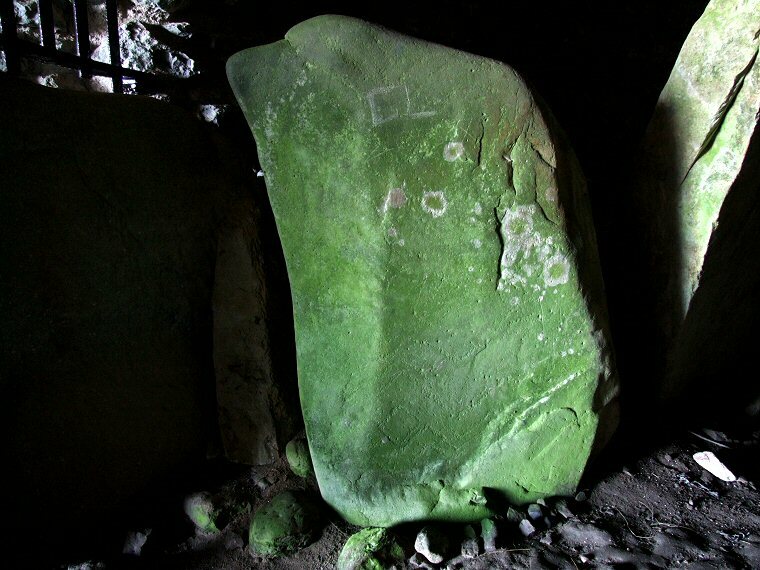 Barclodiad y Gawres - Stone C3 is at the base of the eastern chamber and has a line of four faint spirals. 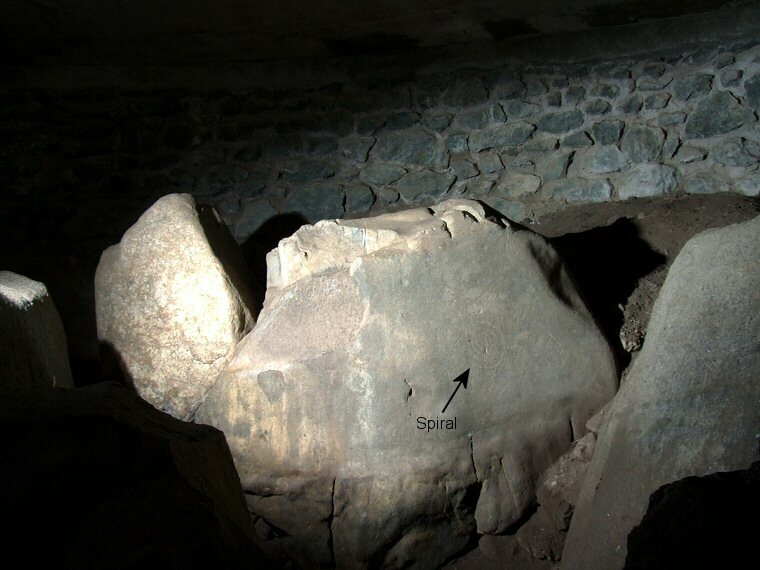 The inner pair spiral clockwise out from the centre while the outer pair spiral anticlockwise The stone to the immediate left is the recently discovered carving which can be faintly seen in the light of the flash. Barclodiad y Gawres - Stone C1 to the east of the entrance with stone L8 immediately to the left (see below). The carvings are very faint but a spiral can be seen to the right of the second crack in middle of the rock. Below and to the right of this spiral are another spiral and several faint diamond and chevron carvings. Barclodiad y Gawres - Stone L8 to the east of the entrance. A double diamond carving can be seen on the lower third of this stone but there are also a series of very faint diamonds and chevrons across much of the rest of the face. 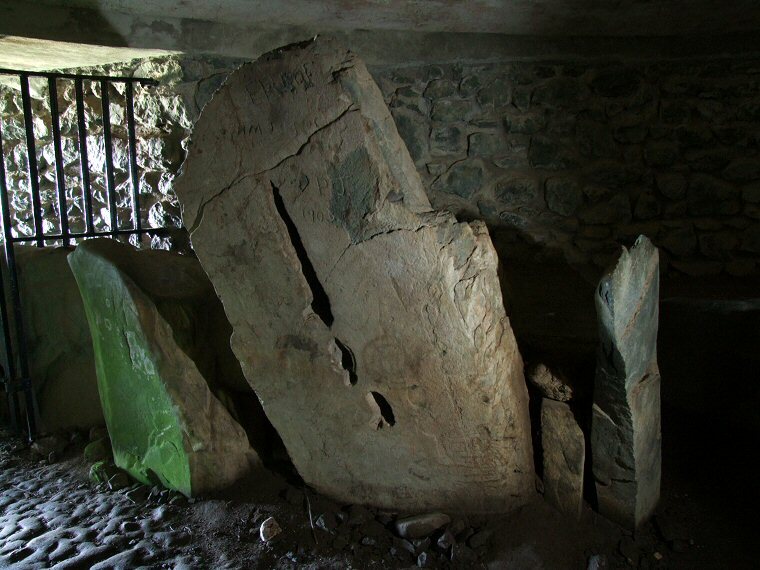 Barclodiad y Gawres - Stone C13 forms part of the back of the western chamber. The highlighted carving consists of a very faint clockwise spiral.